At the time, two major factions within the Punjab were contending for power and influence: the Sikh Sindhanwalias and the Hindu Dogras. The Dogras succeeded in raising Sher Singh, the eldest illegitimate son of Ranjit Singh, to the throne in January 1841. The most prominent Sindhanwalias took refuge on British territory, but had many adherents among the Army of the Punjab. The army was expanding rapidly in the aftermath of Ranjit Singh's death, from 29,000 (with 192 guns) in 1839 to over 80,000 in 1845 as landlords and their retainers took up arms. It proclaimed itself to be the embodiment of the Sikh nation. Its regimental panchayats (committees) formed an alternative power source within the kingdom, declaring that Guru Gobind Singh's ideal of the Sikh commonwealth had been revived, with the Sikhs as a whole assuming all executive, military and civil authority in the State, which British observers decried as a "dangerous military democracy". British representatives and visitors in the Punjab described the regiments as preserving "puritanical" order internally, but also as being in a perpetual state of mutiny or rebellion against the central Durbar (court). Maharajah Sher Singh was unable to meet the pay demands of the army, although he reportedly lavished funds on a degenerate court. In September 1843 he was murdered by his cousin, an officer of the army, Ajit Singh Sindhanwalia. The Dogras took their revenge on those responsible, and Jind Kaur, Ranjit Singh's youngest widow, became regent for her infant son Duleep Singh. After the vizier Hira Singh was killed, while attempting to flee the capital with loot from the royal treasury (toshkana), by troops under Sham Singh Attariwala, Jind Kaur's brother Jawahar Singh became vizier in December 1844. In 1845 he arranged the assassination of Peshaura Singh, who presented a threat to Duleep Singh. For this, he was called to account by the army. Despite attempts to bribe the army he was butchered in September 1845 in the presence of Jind Kaur and Duleep Singh. Jind Kaur publicly vowed revenge against her brother's murderers. She remained regent. Lal Singh became vizier, and Tej Singh became commander of the army. Sikh historians have stressed that both these men were prominent in the Dogra faction. Originally high caste Hindus from outside the Punjab, both had converted to Sikhism in 1818. The actions and attitudes of the British, under Governor General Lord Ellenborough and his successor, Sir Henry Hardinge, are disputed. By most British accounts, their main concern was that the Sikh army, without strong leadership to restrain them, was a serious threat to British territories along the border. Sikh and Indian historians have countered that the military preparations made by these Governors-General were offensive in nature; for example, they prepared bridging trains and siege gun batteries, which would be unlikely to be required in a purely defensive operation. Sikh historians have always maintained that, in order to retain their hold on power and maintain the figurehead rule of Duleep Singh, Lal Singh and Tej Singh embarked on the war with the deliberate intent of breaking their own army. In particular, Lal Singh was corresponding with a British political officer and betraying state and military secrets throughout the war. [page needed] Lal Singh's and Tej Singh's desertion of their armies and refusal to attack when opportunity offered seem inexplicable otherwise. ^ Allen 2001, p. 28. ^ Hernon 2003, p. 546. ^ Grewal 1998, p. 120. ^ Hernon 2003, p. 547. ^ Hernon 2003, p. 548. ^ Farwell 1973, p. 30. ^ Cunningham 1853, p. 257. ^ a b Sidhu 2013. ^ a b Jawandha 2010, p. 64. Farwell, Byron (1973). Queen Victoria's little wars. Wordsworth Editions. ISBN 978-1-84022-216-6. Hernon, Ian (2003). Britain's forgotten wars. Sutton Publishing Ltd. ISBN 978-0-7509-3162-5. Grewal, J. S. (1998). The Sikhs of Punjab. Cambridge University Press. ISBN 978-0-521-26884-4. Cunningham, Joseph (1853). Cunningham's history of the Sikhs. Retrieved 24 July 2015. Sidhu, Amarpal (2010). 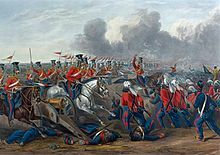 The First Anglo-Sikh War. Stroud, Gloucs: Amberley Publishing Limited. ISBN 978-1-84868-983-1. Jawandha, Nahar (2010). Glimpses of Sikhism. New Delhi: Sanbun Publishers. ISBN 978-93-80213-25-5. Allen, Charles (2001). Soldier Sahibs. Abacus. ISBN 978-0-349-11456-9. A fictionalised description of the origins and course of the First Anglo-Sikh War (as well as various Sikh fortifications including breastworks) can be found in the comedy/adventure novel Flashman and the Mountain of Light by George MacDonald Fraser (1990). However, the book's well-researched footnotes are a source for serious historical information and further reading, such as the memoirs of some of the principals involved.